Greg Libecci of the Salt Lake City School District chronicles some of the achievements he’s helped realize after nine years as the Energy and Resource Manager for dozens of schools. His work led to the school district receiving a 2015 Mayor’s Skyline Challenge Award from Salt Lake City. Thanks for all you do Greg! Greg Libecci, right, stands near solar panels being installed at Hillside Middle School in Salt Lake City. School’s out this week, but that doesn’t mean Greg Libecci takes the summer off. His role as Energy and Resource Manager means he works year-round to identify and implement energy efficiency projects to save the Salt Lake City School District energy and money. What led him to this role? After several years of working in corporate sales for a telecom company, Greg began to notice energy waste everywhere. Things that were not being used were often left on, racking up unnecessary expenses and negatively impacting the environment. He was certainly on to something with these observations, since the excessive consumption of energy resources worldwide is recognized as an important contributor to climate change. Greg was drawn into the sustainability field because he saw how simple it could be to prevent unnecessary energy use. He was excited by the solvable nature of the problem. When the Salt Lake City School District (SLCSD) created the Energy and Resource Manager position nine years ago in an effort to save the District money on utility costs, it seemed like the perfect opportunity for Greg to pursue his newfound passion for energy conservation. Not only would he have the opportunity to directly implement important sustainability initiatives at a large organization, but he would also have the chance to work with students, something that remains an extremely rewarding part of his job. Since Greg took the position, the school district has seen huge reductions in energy and natural gas use. In comparison with their baseline year of 2009, 2017 saw an 11% decrease in electricity use and a 23% decrease in natural gas usage. Heavy appetizers and drinks will be served courtesy of Cucina Toscana. Salt Lake City’s Public Safety Building is the first Net Zero facility of its kind in the country. Even so, energy benchmarking and tune-ups helped us realize even more dollar and emissions savings. Did you know that our buildings, homes, and small businesses contribute over a third of the pollution that obscures the valley during the winter? Also known as “area sources,” this sector is the second-largest source of emissions and is forecasted to become the largest one in the coming years (as cars continually get cleaner due to federal regulations). This is why everything we can do to reduce emissions from our homes and buildings can make a difference to our environment and public health. It’s also why the City is focused on educating residents and businesses about the crucial role of efficiency to our airshed and to our carbon footprint. To this end, we provide guides for home improvements, including details on thermostat controls, home insulation and efficient appliances to help move residential buildings toward a cleaner energy future. “Head of the class.” “Leaders.” “Innovators.” They’re called many things. At Salt Lake City, we call the building owners that go above-and-beyond to cut emissions our “Mayor’s Skyline Challenge Winners”, and it is our pleasure to introduce you to them. 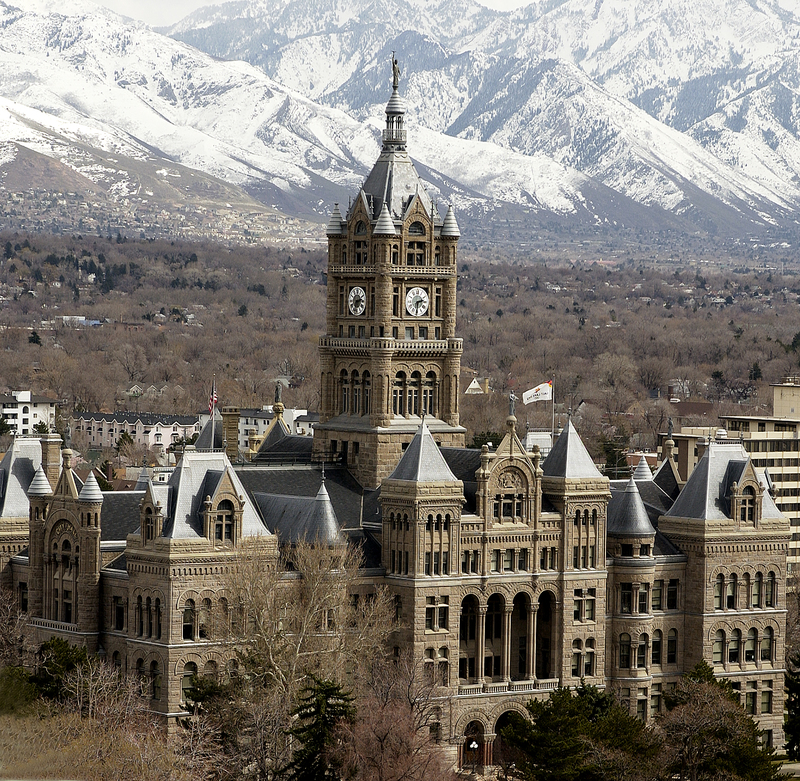 Last Friday, Salt Lake City was recognized by The White House and U.S. Department of Energy (DOE) for its efforts to unlock access to energy data for building owners and improve energy efficiency. Since 2013, Salt Lake City has partnered with both Rocky Mountain Power and Questar to provide whole-building energy data access to building owners through the Environmental Protection Agency’s ENERGY STAR Portfolio Manager Tool. The effort, which is on track for completion in 2017, will ensure effortless energy data management for building owners, providing a complete picture as to building energy use and enabling them to employ more responsive strategies. Salt Lake City is committed to improving air quality, and buildings play an important role in emissions. The most recent data from the Utah Division of Air Quality show that 39% of existing air pollution comes from area sources (i.e. homes and businesses). This percentage is expected to increase significantly over the next 20 years as vehicles become more efficient, making building energy efficiency efforts more and more important. Last week, Mayor Jackie Biskupski extended an invitation to leading industry experts to share their ideas and best practices for energy efficiency in buildings, as part of the Elevate Buildings process. Learn more about Salt Lake City’s efforts to cut energy waste in buildings at SLCgov.com/ProjectSkyline.